The NHRA Mello Yello Drag Racing Series is a drag racing series organized by the National Hot Rod Association (NHRA). It is the top competition series of the NHRA, comprising competition in four classes, including Top Fuel Dragster, Funny Car, Pro Stock, and Pro Stock Motorcycle. The champion of each category is determined by a point system where points are given according to finishing placement and qualifying effort. The season is divided into two segments. After the first 18 races, the Top 10 of each pro category are locked in and compete in the last six races with the difference in points greatly minimized. The series has four main professional classes: Top Fuel Dragster, Funny Car, Pro Stock, and Pro Stock Motorcycle. Top Fuel was the first category, with Funny Cars added in 1966, Pro Stock four years later and Pro Stock Motorcycles in 1987. Both Top Fuel and Funny Cars regularly see top speeds in excess of 300 miles per hour (480 km/h) today, and one thousand foot times anywhere from 3.70 to 4 seconds. Both these cars burn fuel consisting of 90% nitromethane and 10% methanol. The Pro Stock record is 214 miles per hour (344 km/h), with times often in the 6.4-6.7 second range and the Pro Stock Motorcycles usually run at 190+ mph (310 km/h), with times in the low 7- to high 6-second range. Top Fuel (class designation: AA/D top fuel dragster) and Fuel Funny Car (class designation: AA/FC top fuel coupe) have recently been limited to a 1,000-foot (300 m) track, instead of the historic 1/4 mile [1,320 feet (402 m)], as a means to limit top speeds and increase safety (there had been a number of engine explosions at or near 300 mph resulting in driver injuries and death). Currently, driver and spectator safety has been enhanced even while top speeds often approach and exceed 300 mph. Some of the popular racers to come through the series include "Big Daddy" Don Garlits, Don "The Snake" Prudhomme, and Shirley Muldowney. Those three gained much attention from the 1960s through 1970s with their speed and personalities, a combination rarely achieved today through the political correctness of sponsorship in today's drivers. Nonetheless there are still colorful characters today, such as 16-time Funny Car world champion John Force. His daughter, 2007 Rookie of the Year Ashley Force Hood has made appearances on Good Morning America and The Tonight Show and was voted AOL's Hottest Female Athlete in 2007. On July 2, 2008, following the death of Funny Car driver Scott Kalitta, the NHRA announced that race distances for Top Fuel and Funny Car classes would temporarily be reduced to 1,000 ft from the traditional 1/4 mile (1320 ft). The measure was intended to be temporary while safety solutions were explored; however, the races have remained at 1000 feet since Kalitta's death. Although unpopular with the fans, the distance remains at 1,000 feet today at the request of the teams as a cost-saving measure, with no indication by NHRA officials of any intent of returning to the full quarter-mile format any time soon. By late 2012, 1,000 foot racing became globally recognised as the 2012 FIA European title in Top Fuel became 1,000-foot championships, as Santa Pod and Hockenheim (the last two quarter-mile nitro strips) made the switch, and Australian nitro racing switched to the 1,000-foot distance only for selected tracks. 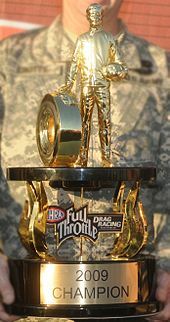 Starting with the 2007 season, the NHRA implemented a playoff system to determine the champion in each class, billed as the Countdown to The Championship. Each season is divided into two segments of races, with the bulk of the races making up the first segment, and the final events making up the second segment. After the first segment is complete, the drivers in each class at or above the cutoff point in the standings (8th place up to 2007 and 10th place thereafter) become eligible for the championship, while the drivers below the cutoff point are eliminated from championship contention, though they still participate in the remaining race events. The points for the advancing drivers are readjusted so that they are separated by a fixed margin, with first place receiving bonus points. The drivers then compete for the championship over the final races of the season. Winston cigarettes was the title sponsor of the series from 1975 until 2001, when a condition of the Master Settlement Agreement required Winston to drop either its sponsorship of the NHRA, or the NASCAR Winston Cup Series; Winston chose to retain its NASCAR sponsorship. Winston ended their sponsorship with NASCAR two years later. The Coca-Cola Company has since held the title sponsorship rights for the series, under a deal that, in 2012, was extended through 2018. From 2001 to 2008, the series was branded with the company's Powerade brand, before switching to Full Throttle in 2009. In 2013, following Coca-Cola's most recent extension of its sponsorship, the title sponsor was changed to Mello Yello. With Mello Yello having introduced a new logo, the NHRA unveiled a new logo for the series in January 2016, as well as a new "My NHRA" marketing campaign that plays upon the logo to feature drivers and other personalities discussing what the NHRA means to them. Before 1974, the season champion was determined by the winner of the World Finals event. The Professional categories contain the divisions of Top Fuel, Funny Car, Pro Stock (Automobile), and Pro Stock Motorcycle. NHRA events have been broadcast on television, with such efforts dating back as far as 1983. By the 1990s, events were split between ESPN, NBC, and The Nashville Network. TNN also broadcast a weekly highlight program, NHRA Today. Due to logistical and scheduling issues, including the possibility of long turnaround times between heats, weather delays, and other factors, events are typically broadcast in a condensed form via tape delay. From 1992 until 2000, TNN carried live coverage of selected final rounds, typically with a condensed package to air until the finals began. In 2001, the NHRA entered into an agreement with ESPN for it to become the exclusive broadcaster of NHRA events, shortly after MTV Networks had effectively shut down the CBS motorsport operations after its acquisition of CBS Cable, and the demise of TNN. During its 14-year stint as rightsholder, ESPN faced criticism for the structure and scheduling of its coverage. Due to scheduling conflicts with other sports properties to which it held rights, ESPN typically broadcast its NHRA coverage in inconsistent and otherwise undesirable timeslots. In the final years of the contract, the NHRA attempted to structure selected events so that they could be televised live; by the 2015 season, at least six events were broadcast live. In July 2015, ESPN and the NHRA agreed to end their contract one year early, with the association citing ESPN's scheduling issues as a concern. In turn, the NHRA announced a new television deal with Fox Sports beginning in the 2016 season. Coverage primarily airs on the FS1 and FS2 cable channels, while 4 events per-season are broadcast on Fox (including the flagship U.S. Nationals). Fox committed to televising live Sunday coverage from at least 16 of the 23 events per-season, two-hour qualification broadcasts and encores (including the condensed highlights program NHRA in 30), and coverage of selected Sportsman Series events. NHRA president Peter Clifford explained that the deal would be a "game-changer" for the association, citing Fox's history of motorsports programming, as well as its commitment to increased coverage of NHRA events, including live network television coverage. During the first two years of the contract, Fox had achieved an average viewership of 600,000 viewers—a major increase over ESPN's broadcasts. Some events had attracted an audience of over 1 million. The association cited favorable scheduling practices (including better time slots and additional encores, as well as using NASCAR broadcasts as a lead-in), and increased promotion of the event broadcasts as part of FS1 and FS2's programming, as having helped build their audience. ^ first title after change from front-engine to mid-engine Top Fuel cars, primarily for safety reasons. ^ also won the IHRA World Pro Stock Championship in the same year. Shepherd is the only driver to do so. ^ In 1995, the points system was revamped. The winner of an event received 100 points, runner-up received 90, 3rd place received 80, the other semi-finalist received 70, second round competitors received 50, and all qualifiers would receive 10. ^ Johnson had one of the biggest comebacks in NHRA history, moving from the bottom of the top 10, gaining over 500 points, with half the season completed, to capture the Pro Stock title. ^ Bernstein gave his championship trophy to Alan Johnson, brother, and crew chief of late Top Fuel driver Blaine Johnson, who had died during qualifying at the U.S. nationals that year. ^ Force's 11th Championship in 2001 made him the winningest driver in NHRA history, beating the 11-year-old record held by Pro Stock driver Bob Glidden (10). ^ Nitro class race distance was shortened to 1,000 feet starting July 2, 2008. ^ Schumacher won his record sixth Top Fuel title in 2008, beating the 16-year-old record held by retired Top Fuel driver Joe Amato. ^ Hight's win made John Force the winningest team owner in NHRA history, with 17 total championships (15 as a driver, one with Hight, and another with Tony Pedregon). ^ Edwards went 27 years between NHRA titles (he won the 1981 Sportsman class Modified title), the longest in history. ^ "Meet the Hottest Athlete in Sports". Retrieved 2009-09-08. .
^ "What is the Countdown?". Retrieved 2009-11-16. ^ "After 27 Years, Series Goes Off Tobacco Road". Los Angeles Times. November 8, 2001. Retrieved 15 July 2015. ^ "Mello Yello taking over as NHRA title sponsor". Sports Business Journal. Retrieved 15 July 2015. ^ "NHRA Mello Yello Drag Racing Series logo gets bold makeover". Autoweek. ^ Sharrington, Kevin (October 28, 1990). "Renovations, TV taking the credit for bigger, diverse crowds". Dallas Morning News. Retrieved 12 August 2015. ^ a b "Sources: NHRA Races To Air On FS1, Ending 14-Year ESPN Tie-In". Sports Business Journal. Retrieved 15 July 2015. ^ "NHRA president calls move to Fox Sports in 2016 a 'game-changer' for series". Autoweek. Retrieved 15 July 2015. ^ "Fox TV releases 2018 NHRA Mello Yello drag-racing series schedule". USA Today. Retrieved 2018-03-14. ^ "NHRA Chief Content Officer Ken Adelson talks changes for 2018, relationship with Fox Sports". Awful Announcing. 2018-02-06. Retrieved 2018-03-14.